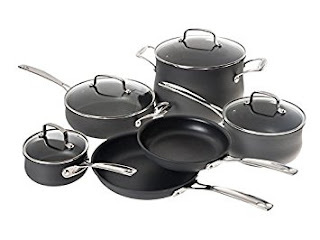 If your needing Cookware - Check out this Deal with Savings on Select Cuisinart Cookware Sets. (1) 1.5 Qt. saucepan with (1) cover; (1) 3.0 Qt. saucepan with (1) cover; (1) 3.5 Qt. saucepan with (1) cover; (1) 8 Qt. stockpot with (1) cover; (1) 8" skillet; (1) 10" non-Stick Skillet; (1) 20cm steamer Insert with (1) cover. 12 pieces total.